Develop algorithms for automatically reconstructing the whole Finnish family tree (genealogical tree). Analyze the structure of the reconstructed tree. A typical birth record in the HisKi data lists at least the names of the parents in addition to the given name and the date of birth of the child. The main challenge is that there are many people with the same name so identifying the parents of a child is not straightforward. To make the problem even more challenging (but also more interesting! ), there are often many alternative spellings for a single name and some records are missing in the first place. After solving the first problem (even to some extent), there is a huge number of interesting questions one can start looking at. For example: Are there some branches of the tree that don’t mix even though the people have lived nearby, suggesting some sort of a class division? How have migration patterns between cities evolved over the centuries? What are the effects of events such disease or war outbreaks? I have already reconstructed the first trees but a lot of preprocessing and cleaning of the data still needs to take place before I get to tackle the questions mentioned above. In the meanwhile, here’s a simple plot of the number of birth records per year. 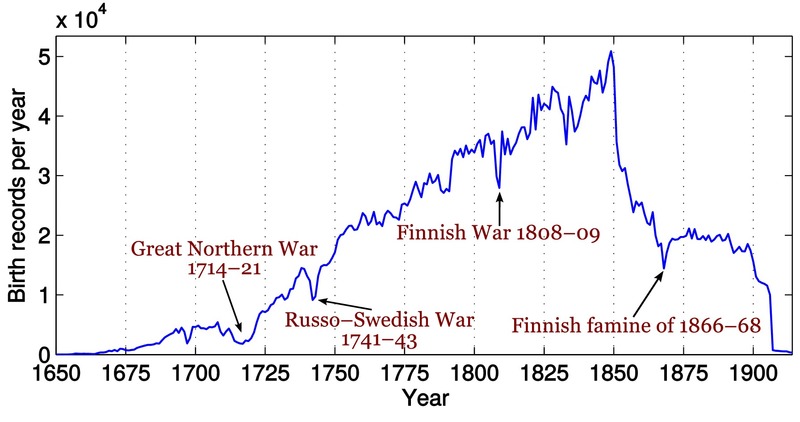 It shows clear drops around three wars and the Finnish famine of 1866–1868. The number of records also drops after year 1850 since most of the documents that are newer than this have not been digitized yet. For using HisKi as (one) starting point for analyses of social segregation, you might like to check, for example, Jarkko Keskinen’s PhD work “Oma ja yhteinen etu. Kauppiaiden keskinäinen kilpailu ja yhteistyö Porin paikallisyhteisössä 1765-1845″ (2012) or Merja Uotila’s recent ” Käsityöläinen kyläyhteisönsä jäsenenä : prosopografinen analyysi Hollolan käsityöläisistä 1810-1840″. For example.